I’m eager to share pictures of the grand ball with you, but I want to insert this post before continuing to ball pictures. 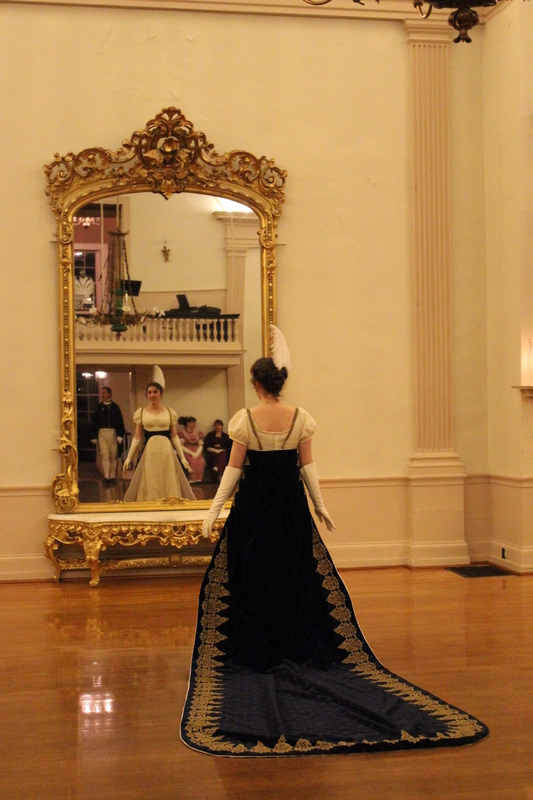 One of my friends had the ambition to complete a Regency court train to wear during the reception I showed pictures of last post. It’s a pretty fabulous train made of velvet printed with golden bees and trimmed with opulent gold lace. The actual owner and maker of the train. It’s not the sort of thing to be danced in, but that’s fine, because it attaches at the waist, so it’s easy to take off. During the course of the evening some of us tried on the train and tried out different poses in it. So nice of Antonia to share with all of us! It was quite grand and fabulous. Pretty pretty princess royalty face. It’s my blog, and that means I can share as many pictures of me as I want…! Spoiled sounding? Probably… Okay, fine, I’ll return to my more humble un-royalty roots. There are some absolutely stunning extant court trains out there. 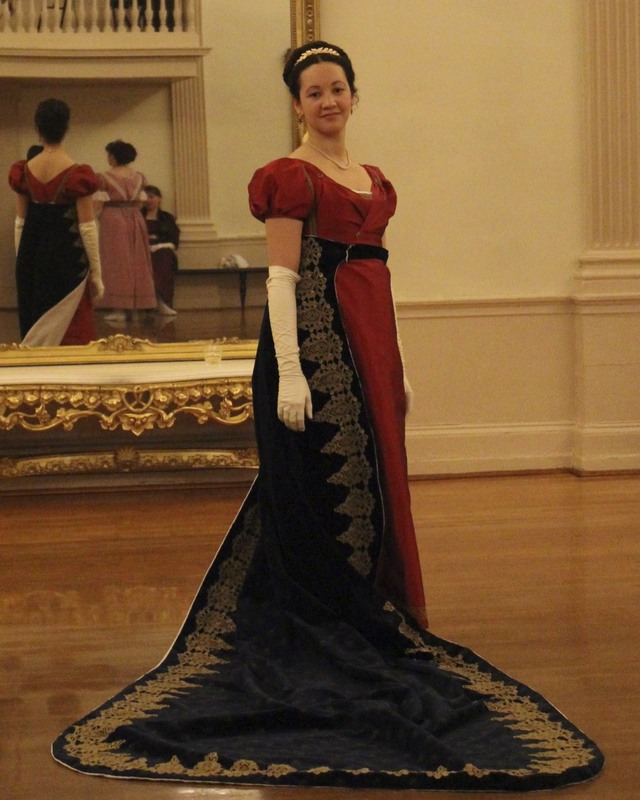 Here’s my pinterest page of court gowns and trains from all different periods. 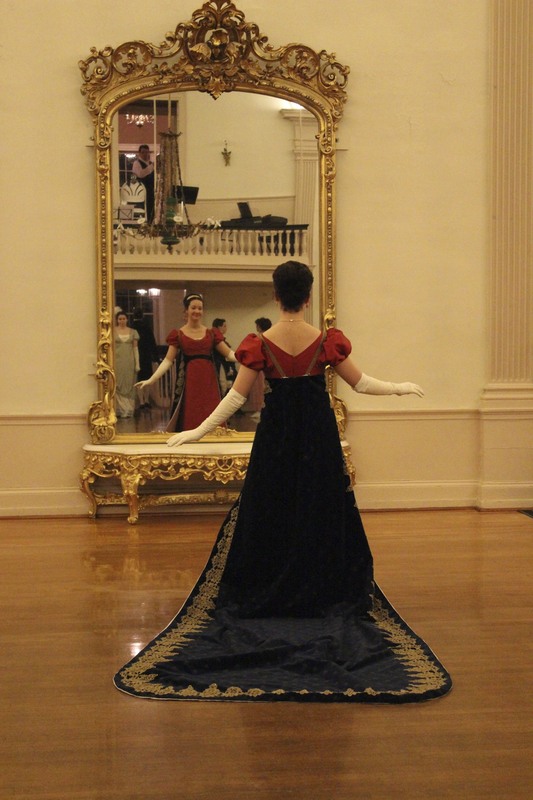 And here are some of my favorite Regency court trains to inspire you. There is an event at Dress U in about a month that requires court gowns or trains. I won’t be there, but I’m looking forward to seeing pictures of other people’s fabulous court trains! I hope you’ve enjoyed these silly pictures. 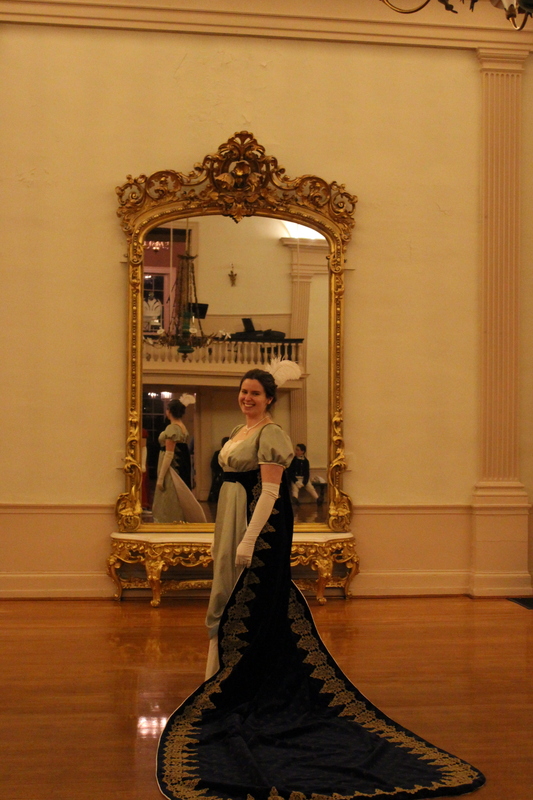 I promise that the next post in this series about the Regency Weekend will be pictures of the ball: no more delays! 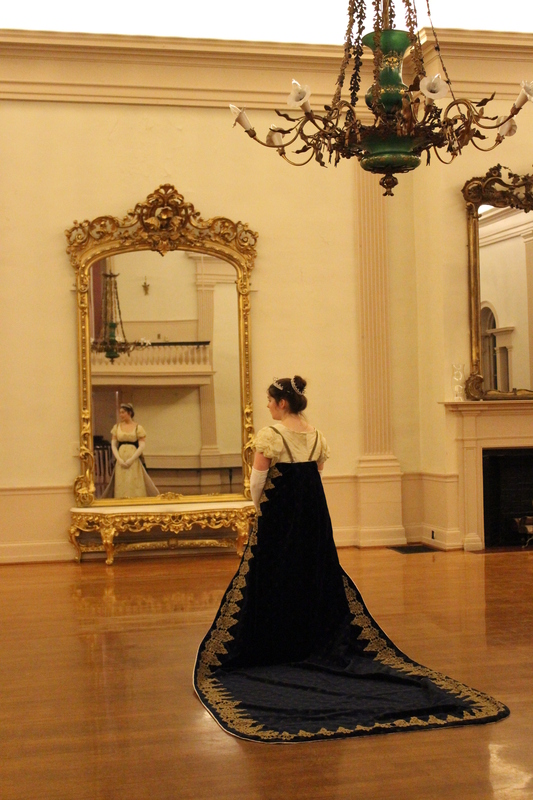 This entry was posted in 1810s, 19th Century, Just Plain Silly, Museum Clothing Pieces, Regency Clothing, Regency Intensive Dance Weekend 2013, Wearing Reproduction Clothing and tagged 1810s, 19th Century, Clothing, Court Train, Historic Clothing, Regency. Bookmark the permalink. Hmm… what an interesting way to wear a removable train. Kinda like a backpack, no? Lol, yes, I suppose it is rather like a backpack! Oh, my, Quinn. How gorgeous! 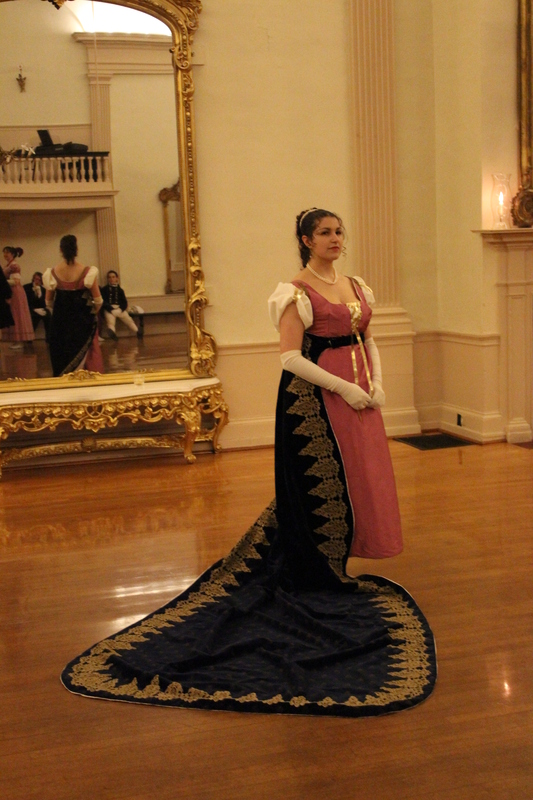 Even though not your court train, still exquisite! Thanks for sharing.